you refused to submit to a breath, blood or urine test. Any person arrested for DUI in Tampa or Hillsborough County will be taken to Central Breath Testing (CBT) where breath-alcohol tests are administered. Several Intoxilyzer 8000 machines are maintained at the CBT Unit located at the Hillsborough County Orient Road Jail. In some cases, after an arrested in Hillsborough County, a breath-alcohol test might be administered in a mobile facility called a BAT. The BAT mobile unit is often used during checkpoints and saturation patrols where a larger number of arrests are expected near a single location. After the administrative suspension takes effect (usually on the day of the arrest), the driver only has ten (10) days to demand the formal review hearing. You can hire a DUI defense attorney to demand a formal review hearing with the Bureau of Administrative Review (BAR) of the Florida Department of Highway (DHSMV) in Tampa, FL. The formal review hearing to contest the administrative suspension after a DUI arrest is governed by the administrative rules found in Chapter 15A-6, F.A.C. You have the right to confront and cross-examine the arresting officer, breath test operator, and other witnesses in the case. FAC Rule 15A-6.013(5) affords the driver seeking review “the right to present evidence relevant to the issues, to cross-examine opposing witnesses, to impeach any witness, and to rebut the evidence presented against the driver.” Fla. Admin. Code R. 15A-6.013(5). The dash cam or body cam video is very important in these cases. In Wiggins. v. Dept of Highway Safety & Motor Vehicles the court found that “a circuit court applies the correct law by rejecting officer testimony as being competent, substantial evidence when that testimony is contrary to and refuted by objective real-time video evidence.” 209 So. 3d 1165, 1175 (Fla. 2017) [42 Fla. L. Weekly S85a]. If the arresting officer or breath tech operator fails to appear in response to a properly served subpoena, then the suspension shall be invalidated. If another witness fails to appear, you have the option to seek enforcement of the subpoena in the trial court. Contact a DUI defense attorney in Tampa, FL, at the Sammis Law Firm to discuss ways to fight your administrative suspension. Call (813) 250-0500. The Bureau of Administrative Reviews (BAR) is made up of senior clerks, field hearing officers. field supervisors, program managers, support staff and regulatory program specialists. Composed of offices located throughout the state of Florida, the Bureau is divided into three regions. Each region is comprised of a number of permanent offices. Some regions also contain satellite offices that are staffed at various days and hours. The major responsibility of the BAR is to conduct administrative hearings, review hearings and investigations for driver license issues along with business license revocation hearings. The three BAR regions are structured into Region I, Region II, and Region III. The Tampa and Clearwater offices are included within Region II. A hearing officer working for the Bureau of Administrative Reviews (BAR) Office conducts hearings as assigned and may attend to the administrative functions including filing, customer interaction and scheduling along with any additional assigned tasks. maintain any state equipment assigned for their use in accordance with current policies. D.U.I. Driver’s License Administrative Suspension Checklist – the checklist is completed by the arresting officer to show that all required documents have been completed and included in the DUI administrative suspension package. (Form TPD 5). 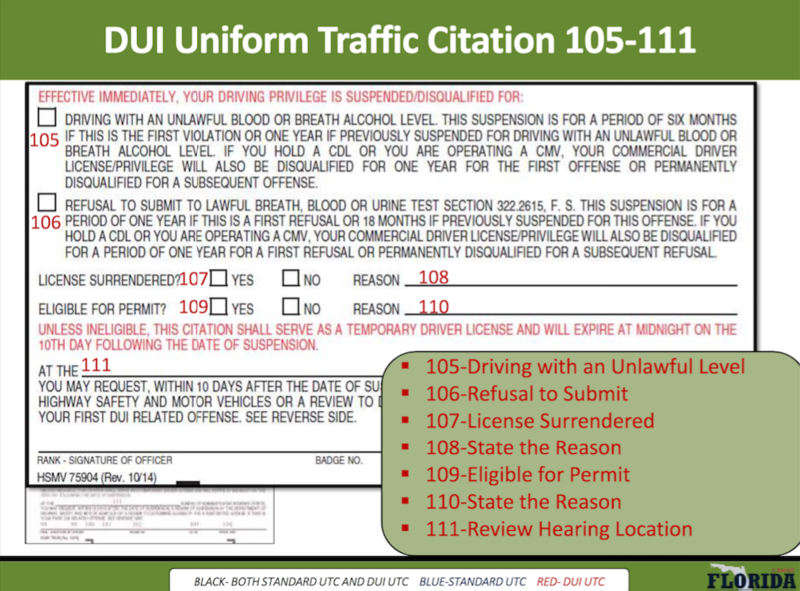 Florida DUI Uniform Traffic Citation – the citation is used exclusively for DUI offenses with an alcohol level of .08 or above or for refusing to submit to breath, blood, or urine tests. The Florida DUI UTC also operates as the notice of the administrative suspension. Criminal Report Affidavit (CRA) – A charging document for criminal violations. (Form SAO 425). CBTU Refusal Affidavit – this form is completed by the Breath Test Operator when a subject refuses to submit to a breath test. The document verifies that a properly operational breath test instrument and Breath Test Operator were available at CBT. The form is retained by CBT. (Form HCSO 5224). Alcohol/Drug Influence Attachment (TPD 312) – this form is used to assist officers in recording data pertaining to all D.U.I. investigations. Breath Test Operator – this form shows that a person qualified to administer a breath test utilizing an approved instrument according to FDLE standards. Breath Alcohol Test Affidavit – this form shows the breath-alcohol test results and the FDLE certification for the Breath Test Operator. (Form FDLE 38). Breath Alcohol Analysis Report – this form documents the 20-minute observation period and other statistical data. This form confirms that the subject did not take anything orally and did not regurgitate during the observation time. (Form HCSO 5730). Affidavit of Refusal to Submit to Breath, Urine or Blood Test – the affidavit of refusal is a form that documents the issuance of the “Implied Consent Warning” to the subject who allegedly refuses to submit to chemical tests for alcohol or controlled substances. (Form DHSMV 78054). Can I Get the Administrative Suspension Invalidated if I’m Found “Not Guilty”? I’ve already gotten the administrative suspension and I was not able to get it invalidated during the formal or informal review hearing. What if I take my case to trial and get a “not guilty” verdict? Can I get the administrative suspension invalidated at that point? If you allegedly refused the breath test, however, the DHSMV will not invalidate the suspension even after a “not guilty” verdict at trial. In some cases, you will not be eligible to obtain a hardship license. Instead, your entire hardship license will be served as a hard suspension which means you cannot drive during this period for any reason. Those occurrences that make you NOT eligible for a hardship license include a DUBAL or Refusal suspension with two or more DUI convictions §322.271(2)(a). Florida’s DUI Administrative Suspensions – Read more from the Florida Department of Highway Safety and Motor Vehicle (DHSMV) website about the laws that govern the administrative suspension. Find information on the administrative suspension of persons under the age of 21 for driving with an alcohol level of .02 or above, administrative disqualification laws, and information on the penalties imposed under Florida Statute Section 322.2615, 316.193, 316.1932. If you were arrested for DUI in Hillsborough County, FL, then you need an attorney to help you fight the DUI administrative suspension of your driver’s license. Your attorney can demand a formal review hearing with the Bureau of Administrative Review office in Tampa, FL, to contest the suspension. Your attorney can also help you demand a 42-day permit so that you can continue driving while your attorney fights the suspension. Any undue process that creates an undue hardship deprives the Petitioner of meaningful review and denies him the remedy afforded under Florida Statutes § 322.2615(b). Whether you were issued the notice of suspension on a DUI citation or you received an order of license suspension from David Laliberte, Supervisor and Hearing Officer, we can help. We can protect your rights to due process at these hearings. Contact the attorneys at Sammis Law Firm to discuss ways to protect your driver’s license by demanding a formal review hearing to contest the administrative suspension. This article was last updated by Leslie Sammis on Tuesday, February 26, 2019.